Rule one of my Guide To Comics Bargains on eBay: look elsewhere! I’ve read good things about the U.K. eBay market, but in the United States I’ve found eBay a different story. In almost every case you’re better off buying back issues through an online retailer, where you can find competitive prices and it is easy to buy in bulk, reducing per-book shipping fees. Buying from a retailer may also give additional protection in terms of customer service if your order goes awry. I’ve had excellent luck from MyComicShop.com and recommend them without reservation. That being said, there are some good sellers on eBay (and many of them are retailers themselves). I will sometimes window-shop the high grade Gold and Silver Age key issues auctions, but the prices of most CGC graded books are too rich for my wallet, and I couldn’t spot a bargain there if it hit me in the face. I’m a reader, more than a collector, but this does open up some bargain opportunities, because it aligns with the one circumstance where I recommend buying comics on eBay: buy in lots. eBay Comic Book Bargains — Comin’ At Ya! The primary advantage to buying in lots is reducing the impact of shipping fees. Unless you’re buying a high ticket item, the cost of postage has risen to the point that buying individual comics on eBay just doesn’t make sense (and that’s just for domestic rates — international rates are even more obscene). 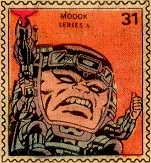 The “Fed-ral Guv’ment” can fill my mailbox with coupons and mass mailers for all sorts of ridiculous nonsense for pennies on the pound, but if you want to mail a comic book, it costs as much as sending an anvil to Katmandu. When you’re bargain hunting for books costing a dollar or less, spending ten bucks or more on postage renders the exercise pointless — but a dozen books can ship as cheaply as one, and proportional charges decrease with bulk, so it is sometimes possible to get a good deal if you are willing to buy a dozen or more books in one go. Survey results from my Longbox Soapbox questionnaire several weeks ago showed interest in articles about comics collecting. 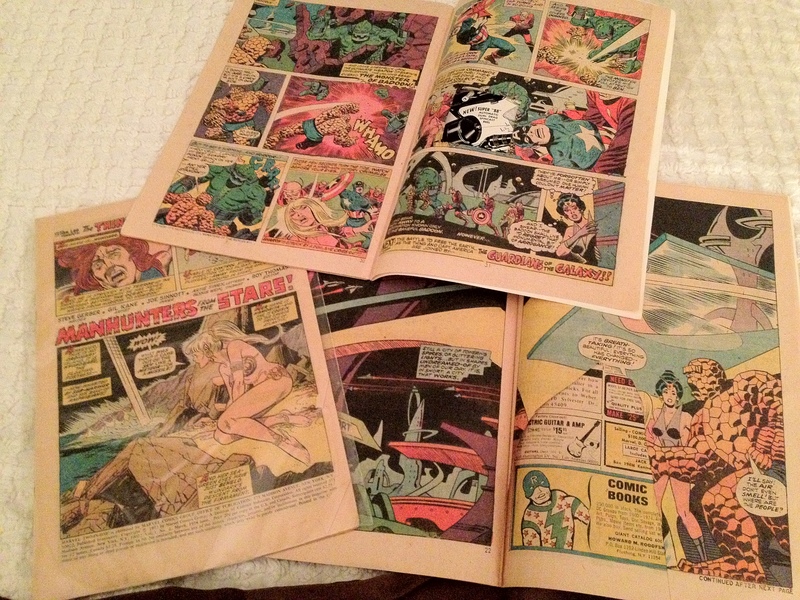 I’m far from an expert but I’m happy to share my experience in this area with you — and if you are interested in lower-grade “reader” copies of Bronze Age books, then you’ve come to the right place! If you follow a few simple rules you can quickly build out a fun collection of books that won’t measure up to a CGC graded collection, but which will look perfectly good in bags and boards and allow you to experience comics in their original form, rather than as digital or graphic novel reprints. 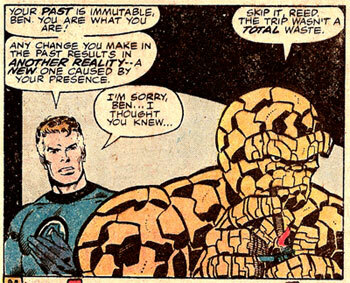 These same principles apply to filling out the bulk of an old comics run, too — you might have to splurge to get that #1, but maybe you can make it up by shaving some dollars off acquiring #32-68 (or whatever). Rather than list general do’s and don’ts, I thought I’d let you ride along on a recent eBay shopping expedition. Last week I reviewed every issue of Marvel Two-In-One, but when that project began, I had only 25 issues of the book’s 100 issue run. This week I’ll tell you how I filled in the rest of the series. An important step is to make a wish list. I have thousands of comics and there’s no sense buying doubles of books I’ve already got. Make a list of the issues you want and keep it with you — I access my Collectorz.com comics database for my wish list via my iPhone, but you can just as easily use the notepad on your smartphone, or just write down what you want and keep the list in your wallet. Either way, you must make a list, and you must keep it with you, because I guarantee the day you find a treasure trove of books at attractive prices at a show or an old bookstore is going to be the day you left your list at home. With a list in hand, it’s time to set your budget. Decide the average price you want to pay per book. 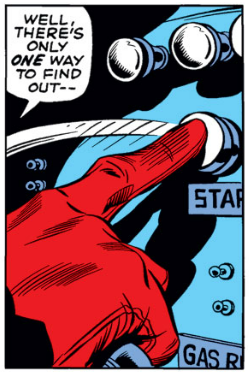 For Marvel Two-In-One, I’d like to spend around a dollar per book. I’m not especially sensitive to grade, so this shouldn’t be impossible … and an insensitivity to grade is a functional requirement for comics shopping non CGC-graded books on eBay, where grading standards are all over the place, and I have several times wound up with books that were in poorer condition than advertised. (Which is a bit of foreshadowing, by the way). 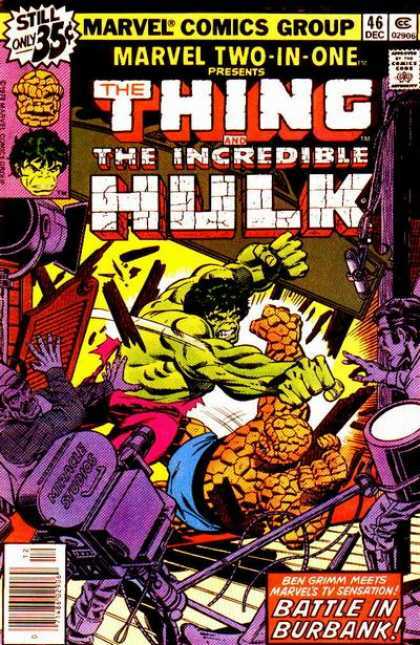 if the Hulk and the Thing wrecked Burbank in a battle … how could you tell? If you have your list, and you’ve set a budget, it’s time to hit eBay. Search for your title several different ways — for instance I searched for “Two In One,” “Marvel Two In One,” and “Marvel Two-In-One” while conducting this particular shopping expedition. The other terms you’ll want to use are “Lot” or “Run” — this will sweep up all the listings that use those common terms in their title. In this case my search returned 75 results, which I quickly narrowed down by sorting by “Price + Shipping: lowest first.” I’m bargain shopping so I need to zero in on the least expensive runs, and this pushes clowns like the guy wanting three hundred bucks for his 68-issue run of Two-In-One well down the page (and good luck with that one, pal). I’m looking for seventy-five books at a buck a book, so I won’t even look at anything that runs more than a hundred dollars or so, postage included. This is the most important principle of buying comics on eBay — know your price, and stick to it. eBay is an auction site, and you will sometimes find yourself in a bidding war for what you want. The best way to win a bidding war is to withdraw. Seriously, it is a buyer’s market on eBay (at least it should be), so don’t bid a nickel more for a book than you want to pay. I recommend entering your top price when placing a bid and then NEVER bidding again. If you get your books for your price, that’s a good thing. If you don’t get your books for more than you wanted to pay, then that’s a good thing, too. you cannot change the past, nor control the future, so bid ONCE and ONCE ONLY! … which is fairly descriptive, but I still need to do a little math to see how many books are actually in that lot, then compare to the price plus shipping to see if I am in my dollar-per-book target range. A cursory glance might make it seem that this is a lot of issues #23-66 … but it’s actually a lot of ten issues between the numbers #23 and #66. I hate these listings and I won’t bid on them. Likewise I skip listings by tools that insist I L@@K! or persist in branding their comics “vintage,” which is a code word for “I don’t know crap about comics and I am charging too much.” It should go without saying that you must always review the full item description to make sure what is on offer, and also examine any photos (which for bulk purchases such as these will usually show a sloppy pile of comics spilled across a horrid kitchen tablecloth). About a half hour of poking around let me isolate two possible Marvel Two-In-One lots. Even allowing for the inevitable duplicates that come with buying in lots, for each of these listings, the cost per book (including postage) falls within my dollar-per-book range. The mikevc21806 lot consists of seven issues that I don’t need or want, so I evaluate price as if this were a seventeen issue lot. He wants a reasonable $6.00 for postage, meaning I can bid eleven dollars for this lot and still get them for a dollar per book. The minimum bid is $9.99 so this is just barely possible — if no one goes up against me for this lot, I can get the deal I want. The same books at MyComicShop.com would run me $23.50 so this is a good deal. The lot from sdm1000 offers a whopping eighteen books I don’t want — but also 34 that I do want. He wants $13.00 shipping and his minimum bid is $15.00, so this lot will also work for me, though it will result in a pile of books I will later need to sell or give away. These same books would run me $44.00 through my MyComicShop.com, so again, I have found an eBay bargain! … do nothing. Seriously, walk away. Put the books on your watch list and cool off for a couple days. I don’t suggest trying to “snipe” an auction with last-second bidding, but I do think you should place your only bid as the auction winds down rather than holding your place early with a minimum bid. Bidding early validates a listing for browsing competitors and may attract additional bids, which you don’t want. A bid is a bid and it locks you into a potential purchase, even if you change your mind or find a better deal before the bid comes due. Why commit yourself before you have to? It was while my lots were in the watching zone that I did a little leg work to check other supply channels. 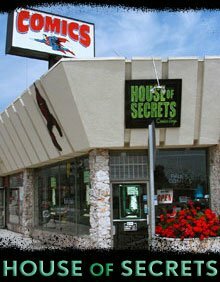 A business trip let me visit The House of Secrets comic shop in Burbank, CA, where they have a pretty decent selection of Bronze Age back issues. I found that most of their Marvel Two-In-Ones were $2.99 — obviously more than my dollar per book target, but I will sometimes go a little higher if I can buy a book in person, because it lets me support a worthy store, I can eyeball what I’m getting right on the spot, and you don’t have to pay for postage. That was still too much to pay in the “lot” phase of filling in my run, though — at that rate, it would cost me $225 to buy 75 issues of Marvel Two-In-One, which is way too much. An issue here or there, sure, $2.99 is fine — it’s less than the cost of a contemporary comic and I like the oldies more. But that’s for later — we’re still shopping lots here! There’s too much overlap between the two lots to buy them both, so this will be an either-or proposition. I decide that sdm1000’s lot will be my primary target, because the seller has a much higher feedback rating, and also because he’s charging more for postage — I suspect this will be for a USPS flat rate box, which should better protect the books in transit. The other lot wants only six dollars for postage, but he is offering too many books to fit in a flat rate envelope. I suspect he will be shipping media mail, which is economical but technically illegal for comics, which don’t quality for media rate because they contain advertisements (I don’t like it either, but direct your gripes to the post office). After cooling off a couple days, I checked back in on Saturday night and determined I still wanted to buy this lot, so I entered my best bid and went to sleep. I bid $21.01, which when combined with that $13.00 shipping would net me the 34 books I want for my price of a dollar each. I bid the extra penny in the unlikely event I’ll need to beat someone who bids in round numbers. And in the morning I found my minimum bid was good enough — at $28.00 including shipping, I got my 34 books for less than the dollar per book I was hoping to pay. Huzzah for eBay comic book bargains! With this single purchase I have knocked off about half of the books on my Marvel Two-In-One want list. 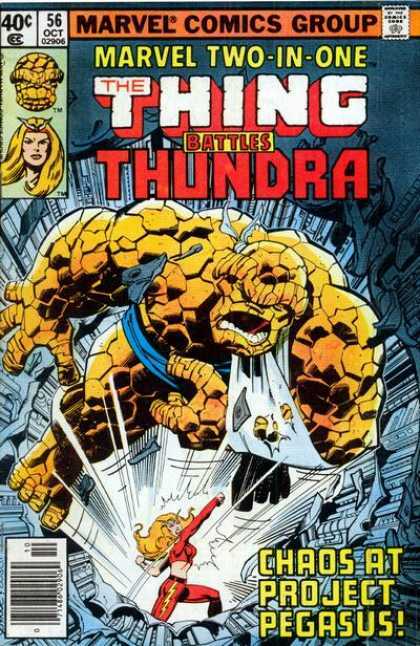 I’m still looking for 43 issues, so I’m in the market for one more lot purchase — but with 57 issues already in my collection, it will prove harder to avoid excessive duplicates in any run. It might make more sense to buy my next “lot” through MyComicShop.com, where I can quickly order only what I want and probably put together a big enough order to qualify for free shipping. Any missing numbers can be filled in through individual issue purchase at shops and shows — it’s always fun to be on the hunt for a couple books at a show. A few days later and my box arrived. Joy! But that joy was tempered when I saw several of the books were in unacceptable condition, with missing covers and pieces cut from them. Never let it be said you don’t get the full experience here on Longbox Graveyard — warts and all! The seller was swift and amicable when I contacted them, and we wrangled out a solution, but it just goes to show that there’s never a dull moment on eBay! So there you have it — Longbox Graveyard’s Guide To Comics Bargains On eBay! Look elsewhere! Online retailers are usually a better source than eBay. Know your price and stick to it (including postage). Watch promising lots and place your bid when they are about to come due. Use the watching phase as a “cooling off period” and check other sources. Bid your best price and never raise. 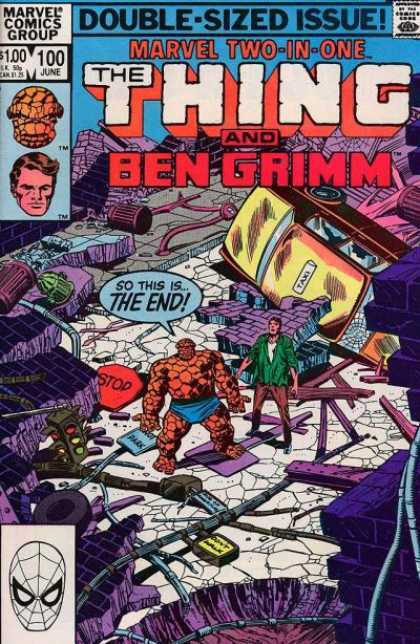 fear not, Ben, this isn’t the end … it’s not even the BEGINNING of the end … collecting goes on forever! What if you simply can’t find a lot for the book you need? There’s one more thing you can try — but it’s risky. Search for .99 issues of what you want on eBay, then click through to the other items that seller has on offer — often sellers will combine postage for multiple items, and if they have offered other books you want individually you can build your own lot this way. Don’t forget eBay is a bidding site! It’s not fun to assume you’re going to win ten books and win only one, and find you’re saddled with a ten dollar postage bill for your dollar comic book bargain. Caveat emptor! That about exhausts my low-rent eBay advice. Please share your own buying wisdom in the comments section, below! And if you’d like to read my impressions of these ill-gotten gains, be sure to check out last week’s review of every single issue of Marvel Two-In-One ever published!! And don’t forget to check out my limited-time offer to basically GIVE you a box of comics — click HERE for details! NEXT WEDNESDAY: #65 Panel Gallery: Made It! Posted on September 5, 2012, in Collecting and tagged Bargains, Buying, Comic Book Social Media Guide, Comic Books, Comics, eBay, Guide, Instagram, Marvel Comics, Pinterest, Selling, Social Media. Bookmark the permalink. 42 Comments. Since we started buying again in 2008, we did most of our shopping on eBay and MyComicShop, too. (Also, we have a used bookstore with 50-cent shelves that rule.) One thing we can add about eBay: For more modern books collected in TPBs, you can find some great bargains. We got complete series of Y: The Last Man and 100 Bullets, and picked up Ex Machina cheap in 2 or 3 bundles. We agree on buying in lots, and our preferred method is buying complete runs. We gained our Dreadstar, Nexus, and Alien Legion collections that way, to name a few. I had a big Dreadstar lot lined up and failed to pull the trigger, and I regret that now. I’ve actually got my wish list down to the point where buying in lots can’t help me any more, unless I decide to start collecting a book like the aforementioned Dreadstar. Right now I’m on the prowl for the last few issues of Tomb of Dracula that will complete my run, and maybe some Iron Fist … then I think I’m “done,” to the degree that ever happens in this hobby. I do sincerely wish to clear out these several longboxes of unwanted books, though, which means I will likely be writing a column eventually about SELLING on eBay, which may closely follow instructions for assisted suicide. Yes, Paul, it’s a great time to be buying comics, a lousy time be selling them. Tip for your readers: Remember to set a minimum reserve if you don’t want to give away books for free. Even trade credit is looking pretty good right now. Heck, I’d trade my paper books for DIGITAL trade credit, so eager am I to reclaim some shelf space. I soldier on. I would love if Marvel or DC offered to “buy back” my old comics of theirs in exchange for a digital copy of everything I turn in. It’s nice to revisit some old stories and runs, but I’m also getting to a point in my life where I don’t need all these books gathering dust. I’m not even a real fan of digital (though I do use the codes on all the new Marvel books to archive digital files into my account), but there’s really no reason for me to be walking around with a complete set of Spider-Man 2099 every time I move. That Spider-Man 2099 set-up is quite the straight line but I’ll just take that one for a strike. It is forward-looking of Marvel to offer digital codes in their new books — it keeps their brick and mortar retailers happy even as it grows their digital audience. Even my big, hardback copy of the Avengers vs. X-Men Omnibus had its own digital code (which I have felt no desire to use). If you don’t plan on using the codes, you should throw them out there for the public on Twitter or or here something. I bet that would spike your numbers. Good idea. Maybe I’ll offer them up as part of a subscription drive or something. Give them out to a random commenter on my 100th blog. I, ummmmm, actually have a party balloon/assisted suicide business. Uh, yeah. Who knew? Not only do I also regret you do not live near Mars’ store I regret we are not all neighbours! It would be the grooviest ’hood ever! And remember: Don’t try suicide! Call Killer Balloons at 606-0842! We’re waiting for you! Great article! A few months ago I got an itch to read some old comics. I haven’t bought comics regularly since 2001. Just not much fun anymore. My prime period would have been from 1976 – 1993 although I buy most 70’s comics. There is only one shop in my area! I found another an hour away but the prices were outrageous. The dealer at my old shop used to sell most issues for $2 so $14 is tough to swallow. 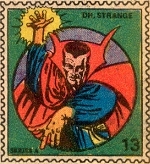 Starlin Warlock run for $8! Best advice I’d give is when the bidding gets higher than you’d like, walk away. The book will probably show up again. Yes, unless we’re talking Silver Age key issues, lots are the only way left to go on eBay, as a buyer or a seller. I’m just about done over there. MyComicShop.com will serve for my remaining back issue needs. It also helps that I’ve adopted digital for archival collections — I’m perfectly happy to read digital issues over hunting up the originals. You’re right about Batman and movie tie-ins. Fortunately, in this area, I plan to be a seller, rather than a buyer! 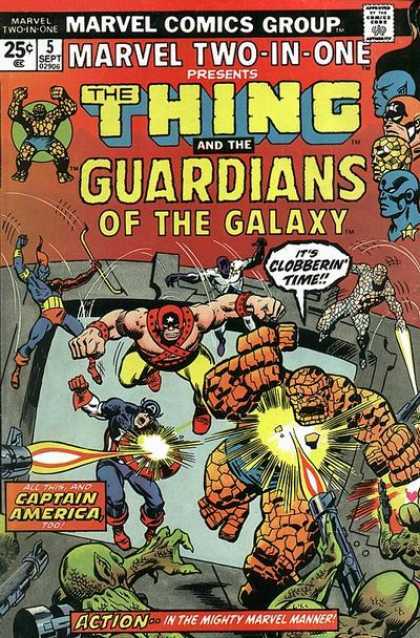 I’ve already circled the date when I can put my old Guardians of the Galaxy books up for auction! Funny. I buy and sell comics on eBay with some frequency (well, about 4 to 6 times a year) and I have had little to no disappointments. I have gotten some great lots of cheap and have never had anything arrive in worse condition than advertised – and quite a few times better! The only disappointments I’ve had have been when I thought I was getting a full run – for example and then realize that I misread the description and one or two issues are missing (just happened to me) – but that is mostly my own fault. I guess the title of the auction could have been clearer in one case or two, but I can’t honestly claim the info was not there just b/c I didn’t see or remember it. Like you, I have about a $1 per issue limit and never pay more than $5 for a single issue comic no matter what it is. Maybe you’re soaking up all the good luck for the rest of us, you rat! I’ve had some success as a seller on eBay the last several months, mostly moving old trade paperbacks or short runs, using Media Rate mail with a wink and a nod toward the postal inspector. But I am still selling at a “loss” in most cases — I just want to get stuff out of here. I will be doing a “final” assessment of the Accumulation in a few weeks, and coming up with my last want list, which I will fill in via MyComicShop.com and (shudder) maybe even eBay. The end is near! Plus, even for more recent comics – I feel like if I read them, I got something out of them – I am happy to get even half what I paid for them. 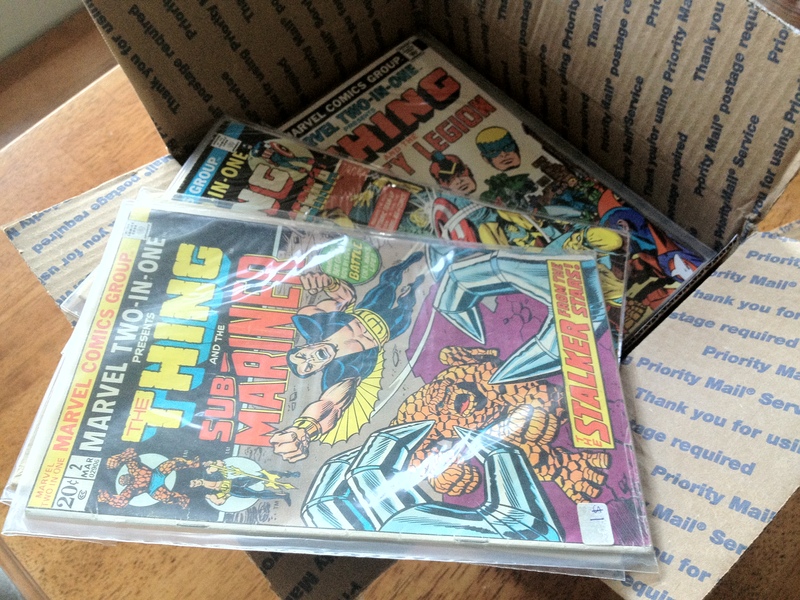 Less than that, well – a friend of mine in another state has a little brother who is into comics and about once a year I box up what I can’t get rid of and send him a care package and he is ecstatic! Whereas most of the books I have sold have been in boxes of 80-100 for $25.00 or so, half of which goes to postage. So, yeah, a loss … but beats tossing them in the recycling bin (just barely). Love your ‘guiding principle!’ Mine is similar: very good is good enough for me! I like that — I think I will steal it! So I finally checked out mycomicshop.com looking for a couple things I am having a hard time finding for cheap and found it to be way overpriced – not just for issues themselves, but even the cheapest shipping options! Do you have some secret, like buying in bulk to save on shipping or something? A couple caveats — first, it has been months since my last order, and prices may have gone up over there; second, I know that there was a sale of either the retail or on-line arm of this company recently, which might have resulted in a new pricing policy. That being said … yes, I always order in bulk from this service, and have never paid postage. I think free shipping kicks in at around $100 (but check me on that!) I also have restricted myself to lower grade comics that I found reasonably priced, but I didn’t shop around and I freely admit to limited expertise in this area! Aside from a history of fast service and a bit of pending trade credit over there, I am not particularly attached to MyComicShop.com … if you have a suggestion for a superior service, I am all ears! I wish I did! I do not. Well, Midtown comics is fantastic and since I live in NYC I can pick them up at the store for no shipping (just ordered 7 comics for less than $10). Not sure how their prices work out with actual shipping – but I usually get Bronze Age stuff in VG or F condition for less than $2 an issue, sometimes less than $1! $100 is way over what I spend on comics at any given time, so that won’t help me. Yeah, I was looking at lower grades, too – but the shipping for just a handful of issues nearly doubles the price. I guess I will just keep hunting around for what I need. Thanks for the advice, such as it is. And I will let you know if I find anything better. Cheers! I’ve also ordered from Midtown, and received good service. Bit of a trick to walk in for my order, though, being 2500 miles away! Mycomicshop, though I love them and still consider them my ‘go to’ online retailer, HAS raised the minimum price for cheapie comics TWICE in the last year or so. $0.80 would get you their cheapest comics last year, and I’ve filled many orders with $0.80 & $0.90 Fines and Very Fines. Those same comics’ prices increased to $1.10 several months ago and again just recently to $1.35. Also, free shipping used to kick in at $50, but that service has either been changed to a higher order total, or done away with completely. These are still the best online prices going, but I have had to curb my spending a bit, of late. Admittedly it has been a long time since I used My Comic Shop. I know they came under new ownership last year; their policies may have changed at that time. I am sitting on a pile of credit with them — some kind soul ordered $2K (!) worth of comics from them through one of my referral links! It is not quite enough to get something genuinely expensive (like the Tomb of Dracula #1 I need to finish out that run), yet it is far too much to just blow on miscellaneous silly back issues (like the Claremont/Byrne Marvel Team-Ups I’d like to fill in, or a complete run of Son of Satan). And so I just sit on it, like a dragon atop his four-color hoard. Not the worst problem to have! I would probably be stunned into inaction by the possibility, myself. Happy spending! I sold a $200+ comic graded a CGC 9.6 on Ebay for $35 + shipping. I don’t know what this seller is seeing, but Ebay is HORRIBLE to sell CGC comics on. That’s hard news. Why did you sell at that price? Was it an auction listing without a minimum?